Echinacea, or purple coneflower, is a perennial herb of the Composite family, commonly known as the daisy family. Most often referred to as the purple coneflower, this hardy plant also known as Sampson root, Missouri snakeroot, and rudbeckia. The prominent, bristly seed head inspired the generic name of the plant, taken from the Greek word echinos meaning hedgehog. Echinacea is a North American prairie native, abundant in the Mid-west, and cultivated widely in ornamental and medicinal gardens. The purple-pink rays of the blossom droop downward from a brassy hued center cone composed of many small, tubular florets. The conspicuous flowers bloom singly on stout, prickly stems from mid-summer to autumn. Flower heads may grow to 4 in (10.16 cm) across. The dark green leaves are opposite, entire, lanceolate, toothed, and hairy with three prominent veins. The narrow upper leaves are attached to the stem with stalks. The lower leaves are longer, emerging from the stem without a leaf stalk, and growing to 8 in (20.32 cm) in length. The plant develops deep, slender, black roots. Echinacea propagates easily from seed or by root cuttings. However, due to its increasing popularity as an herbal supplement, echinacea is numbered among the 19 medicinal plants considered at risk by the Vermont nonprofit organization, United Plant Savers. Three species of echinacea are useful medicinally: Echinacea augustifolia, Echinacea purpurea, and Echinacea pallida. The entire plant has numerous medicinal properties that act synergistically to good effect. Echinacea is most often used to boost the immune system and fight infection. Research has shown that echinacea increases production of interferon in the body. It is antiseptic and antimicrobial, with properties that act to increase the number of white blood cells available to destroy bacteria and slow the spread of infection. As a depurative, the herbal extract cleanses and purifies the bloodstream, and has been used effectively to treat boils. Echinacea is vulnerary, promoting wound healing through the action of a chemical substance in the root known as caffeic acid glycoside. As an alterative and an immuno-modulator, echinacea acts gradually to promote beneficial change in the entire system. It has also been used to treat urinary infection and Candida albicans infections. Echinacea is a febrifuge, useful in reducing fevers. It is also useful in the treatment of hemorrhoids. A tincture, or a strong decoction of echinacea serves as an effective mouthwash for the treatment of pyorrhea and gingivitis. Native American plains Indians relied on echinacea as an all-purpose antiseptic. The Sioux tribe valued the root as a remedy for snake bite, the Cheyenne tribe chewed the root to quench thirst, and another tribe washed their hands in a decoction of echinacea to increase their tolerance of heat. European settlers learned of the North American herb's many uses, and soon numerous echinacea-based remedies were commercially available from pharmaceutical companies in the United States. 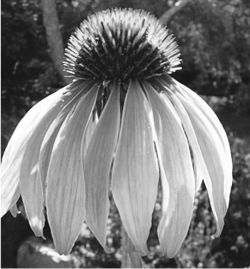 Echinacea was a popular remedy in the United States through the 1930s. It was among many medicinal herbs listed in the U.S. Pharmacopoeia, the official United States government listing of pharmaceutical raw materials and recipes. The herb fell out of popular use in the United States with the availability of antibiotics. In West Germany, over 200 preparations are made from the species E. purpurea. Commercially prepared salves, tinctures, teas, and extracts are marketed using standardized extracts. Echinacea is regaining its status in the United States as a household medicine-chest staple in many homes. It is one of the best-selling herbal supplements in United States health food stores. Clinical studies have found that the entire plant possesses medicinal properties with varying levels of effectiveness. Echinacea is of particular benefit in the treatment of upper respiratory tract infections. Some research has shown that echinacea activates the macrophages that destroy cancer cells and pathogens. When taken after cancer treatments, an extract of the root has been found to increase the body's production of white blood cells. Echinacea has been shown to be most effective when taken at the first sign of illness, rather than when used as a daily preventative. Other research has demonstrated the significant effect of E. purpurea root on reducing the duration and severity of colds and flu. Some herbal references list only the root as the medicinal part, others include the aerial parts of the plant, particularly the leaf. Research studies in Europe and the United States have concluded that the entire plant is medicinally effective. Most research has been done on the species E. pallida and E. purpurea. All three species of echinacea are rich in vitamins and minerals. Echinacea is an herbal source of niacin, chromium, iron, manganese, selenium, silicon, and zinc. The quality of any herbal supplement depends greatly on the conditions of weather and soil where the herb was grown, the timing and care in harvesting, and the manner of preparation and storage. Decoction is the best method to extract the mineral salts and other healing components from the coarser herb materials, such as the root, bark, and stems. It is prepared by adding 1 oz (28.4 g) of the dried plant materials, or 2 oz (56.7 g) of fresh plant parts, to 1 pt (0.47 l) of pure, unchlorinated, boiled water in a non-metallic pot. Simmer for about one half hour. Strain and cover. A decoction may be refrigerated for up to two days and retain its healing qualities. An infusion is the method used to derive benefits from the leaves, flowers, and stems in the form of an herbal tea. Use twice as much fresh, chopped herb as dried herb. Steep in 1 pt (0.47 l) of boiled, unchlorinated water for 10-15 minutes. Strain and cover. Drink warm, sweetened with honey if desired. A standard dose is three cups per day. An infusion will keep for up to two days in the refrigerator and retain its healing qualities. A tincture is the usual method to prepare a concentrated form of the herbal remedy. Tinctures, properly prepared and stored, will retain medicinal potency for two years or more. Combine 4 oz (114 g) of finely cut fresh or powdered dry herb with 1 pt (0.47 l) of brandy, gin, or vodka in a glass container. The alcohol should be enough to cover the plant parts and have a 50/50 ratio of alcohol to water. Place the mixture away from light for about two weeks, shaking several times each day. Strain and store in a tightly capped, dark glass bottle. A standard dose is 0.14 oz (4 ml) of the tincture three times a day. Echinacea is considered safe in recommended doses. Pregnant or lactating women, however, are advised not to take echinacea in injection form. Because the plant has proven immuno-modulating properties, individuals with systemic lupus erythmatosus, rheumatoid arthritis, tuberculosis, leukemia, multiple sclerosis, or AIDS should consult their physician before using echinacea. Echinacea should not be given to children under two years of age, and it should only be given to children over two in consultation with a physician. Research indicates that echinacea is most effective when taken at first onset of symptoms of cold or flu, and when usage is continued no longer than eight weeks. There is some indication that the herb loses its effectiveness when used over a long period of time. It is necessary to interrupt use for a minimum of several weeks in order to give the body's immune system the opportunity to rest and adjust. No side effects are reported with oral administration of echinacea, either in tincture, capsule, or as a tea, when taken according to recommended doses. Chills, fever, and allergic reactions have been reported in some research studies using an injection of the plant extract. Alterative — A medicinal substance that acts gradually to nourish and improve the system. Antimicrobial — A plant substance that acts to inhibit the growth of harmful microorganisms, or acts to destroy them. Febrifuge — A plant substance that acts to prevent or reduce fever. Glycoside — An herbal carbohydrate that exerts powerful effect on hormone-producing tissues. The glycoside breaks down into a sugar and a non-sugar component. Lanceolate — Narrow, leaf shape that is longer than it is wide, and pointed at the end. Macrophage — Specialized cells present throughout the lymphoid tissues of the body that circulate in the bloodstream. Macrophages have a surface marker that stimulates other cells to react to an antigen. None reported. When used in combination with other herbs, dosage should be lowered. Deneen, Sally, and Tracey C. Rembert. "StalkingMedicinal Plants, An International Trade Imperils Wild Herbs." E Magazine July-August 1999. Herb World News Online, Research Reviews. Herb Research Foundation. 1999. http://www.herbs.org. /Echi·na·cea/ (ek″ĭ-na´shah) a genus of North American flowering herbs. E. purpu´rea is used for colds and respiratory and urinary tract infections and for wounds and burns. E. pal´lida root is used for fevers and colds. E. angustifo´lia is used in folk medicine. 1. Any of several coneflowers of the genus Echinacea, having usually pinkish-purple ray flowers. 2. The roots, seeds, or other parts of such a plant, used in herbal medicine. a perennial herb found only in Missouri, Nebraska, and Kansas in the United States. uses It is used for those with low immune status, for hard-to-heal superficial wounds, and as a sun protectant. It is most commonly used to treat the common cold and upper respiratory infections. It has no apparent protective effects but may decrease the duration and symptoms of the infection if started when symptoms are first noticed. There are insufficient reliable data for other indications. contraindications It is not recommended during pregnancy and lactation or in children. It is also contraindicated in people who have autoimmune diseases such as lupus erythematosus, multiple sclerosis, HIV/AIDS, or collagen disease and in people with tuberculosis or hypersensitivity to Bellis species or the Compositae family of herbs. Immunosuppression may occur after extended therapy with this herb. It should not be used for more than 8 weeks. A flower essence believed to provide a sense of self in the face of adversity. A perennial herb, the roots and rhizomes of which contain betain, essential oils (including caryophylene and humulene), echinocoside (which has antibacterail activity), glycosides, inulin, isobutyl amides, resin and sesquiterpene. It is antibacterial, antiviral and diaphoretic; it has been used topically for eczema, herpes, insect and snake bites, itching and wounds, and internally for gastrointestinal, respiratory and urinary tract infections, infectious mononucleosis, septicaemia, sore throat, toothaches and to detoxify blood. (Echinacea angustifolia, E. pallida, E. purpurea) A widely used herbal supplement claimed to act against infectious diseases; some clinical studies suggest value in preventing and treating the common cold; severe adverse reactions include anaphylaxis and angioedema. Synonym(s): comb flower, cone-flower, Missouri (Kansas) snakeroot, snakeroot. a genus of plants in the family Astraceae; source of the popular herbal product echinacea, used mainly as a stimulant of the immune system.